Walking around Wondercon today, I came across quite a few interesting things. Cosplayers, tons of artists, every other booth requiring a few hundred Funko Pops for sale, a booth that sells only Ewok heads (I’m not kidding) and (formerly) Sonic Boom’s own Bill Freiberger. But the most interesting thing for me was IDW’s booth with it’s large banner for Sonic the Hedghog. It features Sonic, Blaze and new gal, Tangle all striking poses. IDW’s acquisition of the Sonic license has given the blue blur a much larger spotlight than he’s had in the past few years with Archie. All the way to the cover of Diamond’s “Previews” catalog and Tangle making headlines across the internet. IDW wants to make sure Sonic is a huge success and what better way than to bring back much of the old team that made the previous book a huge hit to begin with. Including bringing back head writer, Ian Flynn. After his afternoon autograph session, I had the chance to chat with Ian Flynn about all things Sonic. TSS: What differences will there be in how you approach writing IDW Sonic compared to the reboot era of Archie Sonic? Flynn: The reboot era of Archie Sonic was an attempt to please everyone at the same time including both fans of the old style and fans of the newer style while blazing a new trail and doing it all in the first year or two which in hindsight, was impossible. IDW Sonic is a new take. Nothin’ but good ol’ distilled Sonicdom with no outside baggage attached. TSS: Has the announcement of Sonic Mania Plus had any effect on how you were planning to use “certain characters”? Flynn: Yes and we’ll be getting into that at the panel. TSS: Are there any broad concepts you’d want to revisit in the future of the comic (for example; colonies of fish people existing alongside regular land characters)? Flynn: Maybe. Meropis was the brainchild of Aleah Baker so I’d feel a little dirty just cribbing that idea again without her involvement. The series is so new that it’s hard to say what we will or won’t do in the future. The book hasn’t come out yet. Give us some time to establish what IDW Sonic is and then we’ll start building and exploring from there. TSS: Will there be any sections for user content? Like Fan art, questions, letters to the editor? TSS: When Tangle was first introduced, my Twitter account just blew up with fan art of her. Were you surprised at just how well she was received? Flynn: Yes and no. I’m not surprised at just how much people love her. Tyson Hesse did an amazing job designing the character and I knew people would dig her once the book came out. I wasn’t anticipating the VOLUME of fan love this early on. It’s exciting, I’m very happy for it, I just wasn’t expecting it this early on. TSS: Which of your characters from the Archie era do you regret that you can’t bring to IDW? Flynn: If I could transplant a couple, I’d love to bring Relic the Pika and Eclipse. I think those resonated the best with folks. I know folks would have loved to have seen Razor come back, but those first two are near and dear to my heart. TSS: There was once going to be a comic conclusion to Sonic Underground. Is there any chance that can now see the light of day? Flynn: Probably not because the factors that got the story pulled have not changed from what I understand. TSS: How soon did IDW approach you after getting the license from Sega? Flynn: I’m not sure, but I can say with some certainty that they had me on board for a while before the New York Comic Con announcement. TSS: Thank you very much for your time. 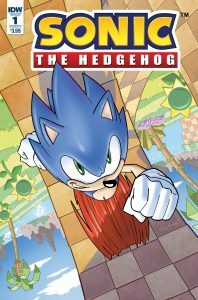 The first issue of IDW’s Sonic the hedgehog will be out Wednesday April 4th. You can pick up a convention exclusive #1 issue at Wondercon this weekend. Stay tuned later this week for my review of the first issue. That’s unfortunate about Eclipse, imo it was the kind of character that needed to be there to “keep up” with Shadow and Shadow’s side of the story that wasn’t Sonic or an Eggman robot. Especially someone connected to Black Doom, too bad that never went anywhere.